North Carolina State University honored Dr. David H. Rose at the Friday Institute for Educational Innovation’s Friday Medal Presentation on Wednesday, November 14, 2012. 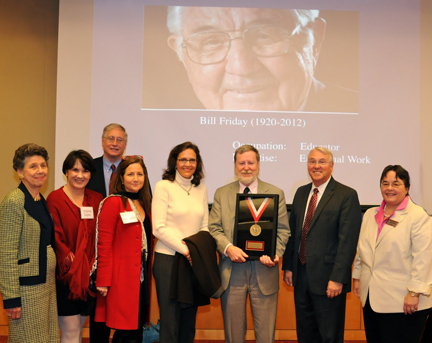 The Friday Medal is awarded annually to honor significant, distinguished and enduring contributions to education and beyond through advocating innovation, advancing education and imparting inspiration. The ceremony also honored the late William Friday who passed away in early October. This special tribute to Mr. Friday included the announcement of a new doctoral student fellowship. Rose is a faculty member at Harvard University where he specializes in Human Development & Reading. He is co-founder and chief education officer for the Center for Applied Special Technology (CAST). His work keeps leading to new insights, and shows us how much people benefit from new ways of thinking about problems in education,” said Dr. Glenn Kleiman, Executive Director, Friday Institute for Educational Innovation. Rose addressed the group on how the combination of neuroscience and technology can allow individuals at all levels to reap the benefits of education. Friday’s daughter Mary Leadbetter Friday also spoke on the impact her Father made on North Carolina State University. “Part of his legacy that he leaves particularly for NC State is one of enthusiasm and great affection for where he spent some very informative years of his youth.” Leadbetter Friday also commented on how her father’s strive for education innovation. To honor this legacy, the Friday Institute for Education and Innovation and the North Carolina State University College of Education announced this evening the William & Ida Friday Graduate Student Fellows Program. The Friday Fellows will be a highly prestigious program that will enable NC State to attract exceptionally capable and dedicated students who will complete their doctoral degrees while contributing to the work of the Friday Institute. The current goal is to raise funds that will assist several doctoral students each year with tuition and research support, as they complete their graduate studies and dissertations that will further the vision of Mr. and Mrs. Friday of a quality education for all students. For more information on the Friday Fellows contact the College of Education Development Office.